By selecting the 44-year old, first-term governor of Alaska Sarah Palin as running mate, Senator John McCain takes a big gamble and the wind out of the lack-of-experience sail that he flies against Senator Barack Obama. By selecting a woman, McCain hopes to win over those supporters of Hillary Clinton who have not lined up behind the Obama-Biden ticket. I believe that his calculation will not work. It is difficult to imagine that those who supported Hillary Clinton and her agenda could possibly vote for McCain simply because of Sarah Palin’s gender—especially not after Senator Obama laid out a Clinton-like agenda during his acceptance speech last night. I for one wanted Hillary Clinton become the first woman president but I would have never supported her without the conviction that she has all the qualifications and the right policy agenda. A primary season in which an African-American, a woman, and a Mormon were among the competitors should do away with voting for candidates simply because of gender, race, ethnicity, religion. Perhaps, if Senator McCain had chosen a woman like Senator Olympia Snowe of Vermont or former New Jersey governor Christie Todd Whitman, he may have won the support of dissatisfied Clinton supporters. But Sarah Palin who is far more palatable to the conservatives than McCain himself? Although younger than Senator Obama, she brings no change to the Republican ticket besides her gender. If the 72-year old McCain were to win the fall election, Palin would be a heartbeat away from the presidency in the nation of 300 million. And that with less than two years of experience as the governor of Alaska with a population of less than 700,000! Nassau County on Long Island, where I live, has a population of 1.4 million, double that of Alaska. What would the reaction be, were a presidential contender select a Nassau county executive as running mate? Senator McCain seems content that a person like Governor Palin who knows how to hunt moose and is a member of the National Rifle Association has the qualification to be commander-in-chief. Or perhaps, as I heard a taking head on CNN say a few minutes ago with admiration, because as a basketball player on her high school team, she was called "Sarah Barracuda” because of her intensity. Not exactly a testament to the Republican presidential candidate's wisdom and judgment. Denver convention in support of her husband was received very well. After all, an Obama victory in November would merely cast her in the supporting role as first lady. But when women reach for the starring role, as Hillary Clinton did in this year’s presidential primary season, they still get bruised as they hit the glass ceiling. The perennial dominance of the good old boys bulwark is alive and well. And when push comes to shove, the persistent old order will pick white or black or Latino males over females of any race or ethnicity. Never mind that Nancy Pelosi rose to become Speaker of the House. Becoming the presidential nominee of one of the major parties and winning the White House is a different story. And Pelosi’s rise in Congress is far from exemplary in the overall political landscape. Unlike the United States, other nations, especially, but not only in the developed world, have left gender prejudices in politics behind—and not only by choosing women as prime ministers and presidents. 28 years after diplomatic relations between the United States and Libya were broken off and 5 years after some diplomatic ties were reestablished, the two countries are now ready to restore full diplomatic relations according to an AP report from the Libyan capital. Libya was taken off the State Department’s list of state sponsors of terrorism in 2003, when Moammar Gadhafi agreed to give up the country’s WMD program and involvement in international terrorism and promised the compensation of terrorism victims’ families. By settling outstanding lawsuits by American families against the Libyan government and by Libyan victims of the 1986 U.S. air raids on Tripoli and Benghazi,the U.S. and Libyan governments removed the final obstacle on the way to full diplomatic relations. During the 1980s and beyond, the United States government considered Libya one of the most flagrant sponsors of international terrorism. After intercepted phone calls implicated Libyan agents in the 1986 bombing of the La Belle Disco in Berlin, a favorite of U.S.military personnel, President Ronald Reagan ordered the retaliatory bombing of two Libyan cities. But the death of 41 Libyans, including Moammar Gadhafi’s adopted daughter, did not end Libya’s involvement in terrorism. 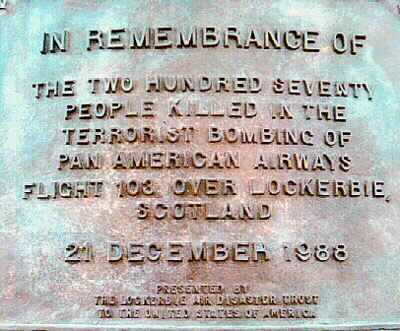 Instead, Gadhafi and his government were responsible for one of the most lethal acts of terrorism: the downing of Pan Am Flight 103 over Lockerbie, Scotland, just days before Christmas 1988 and the death of 270 Americans. What eventually convinced Gadhafi to abandon his involvement in terrorism and his ambition to develop weapons of mass destruction were not actual and threatened military retaliation but American, European and United Nations sanctions that hurt his country’s economy and cast Libya in the role of an outlaw from the perspective of many important members of the international community. Shocking End to the Shocking Anthrax Attacks of 2001? Nearly seven years after letters with lethal anthrax spores were sent to media personalities and to U.S. senators, affecting especially postal workers, who handled the mail, and killing five people and sickening more than a dozen, the FBI closed in on a suspect: Bruce E. Ivens, a 62-year old biodefense researcher at an elite U.S. Army bioweapons laboratory in Fort Detrick, Maryland. Perhaps, we will never know for sure whether Mr. Ivens’ suicide earlier this week was the step of a guilty man finally caught as the perpetrator of the bio-terrorism attacks or of an innocent researcher who broke under the burden of accusations and pressure by FBI agents.